Hinomaru Bento (日の丸弁当) is the most simple Bento lunch in Japan! What you do is you place a red Umeboshi (pickled plum) in the center of the plain white rice. It looks like Japan's flag, Hinomaru (literally, disk of the sun). 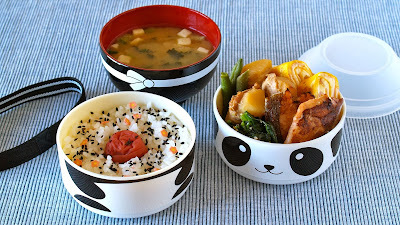 In this video, I will show you how you can assort side dishes to make a typical Japanese Bento!!! Fill the BOTTOM TIER with plain white rice, sprinkle with Furikake (rice seasoning) if you like, make a hole in the center of the rice and place a Umeboshi (pickled plum).